Gothic stole custom made by our expert seamstress Lynne Green is available from Everything Vestment in your choice of red, green, purple, white or black. In addition to your choice of colors, you can also have your choice of trim for your stole, either a Roman cross, square Greek cross or other vestment trim. The Roman cross is shown in the picture on the right. We will make your stole to your specifications. Our stoles are normally 95 inches long and approximately four inches wide, but they can be made longer or shorter according to your specifications. Please allow two weeks for any custom order, including our custom Gothic stoles, to be filled. 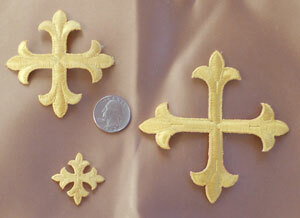 If you prefer, we can add Greek crosses to your stole rather than Roman crosses. Our Greek crosses come in a 1-inch, 2-inch and 3-inch sizes. Please contact us with your preference. Or you can have trims added to your stoles rather than the crosses. You can learn more about our trims here. Just contact us. We'll be happy to work with you to make the stole of your choice. 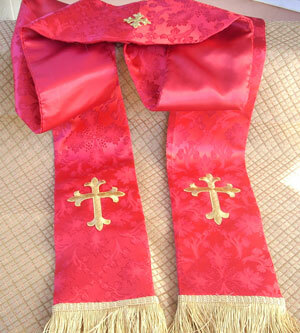 Are you looking for a deacon's stole? 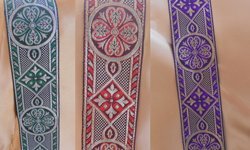 We provide those as well in the colors of red, green, white, purple and black with your choice of trims - either Roman or Greek crosses or matching trim as well. Just contact us here. We have stole patterns, fabric and trim to help you make your own stole. Or make things easier by purchasing one of our stole kits. Our kits include a pattern, fabric, canvas and trim.